Polymer Composites Chemistry is a bundle of technologies grown at SAES to develop advanced polymeric materials mainly featuring getter and gas scavenging properties but rapidly expanding to other functionalities. According to the nature of the functional dispersed phases, formulations comprising monomers, polymers, initiators and other additives can be conceived with the required properties. 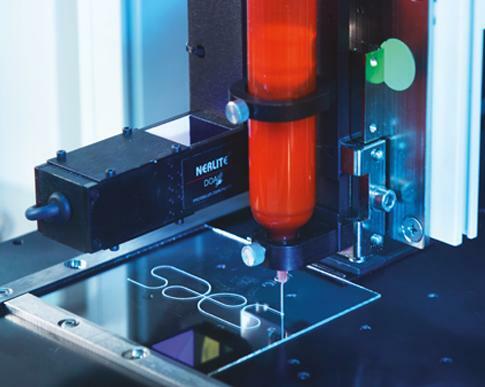 Liquid formulations may be dispensed on several kinds of substrates, such as glass, metals, silicon and plastics. All of the main rheological properties of the formulations must be adapted to the specific dispensing tools available at the customer manufacturing site, such as jetting, blading, screen printing slot-die coating, lacquering and ultimately also ink-jet printing. The photo, thermal or cationic polymerization process to be used to turn the dispensed formulation into a solid film, filler or edge sealant may be finely tuned to perfectly fit with the manufacturing process of the devices where the functional polymer composite material should exploit its properties. Polymer-matrix nano-composites emerge from the simultaneous exploitation of SAES competence in macromolecular chemistry and in nanotechnology which enable the design and the realization of multi-functional polymer composites featuring sorption properties as well as optical, thermal, mechanical and surface properties.